(AP) CHICAGO - A grand jury has handed down an 11-count indictment against three NATO-summit protesters jailed since May, including four terrorism-related counts and seven other charges, according to the document obtained by The Associated Press from defense attorneys. 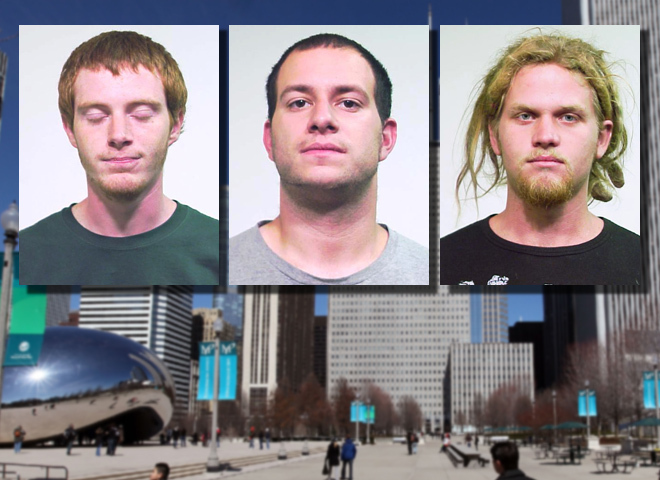 Authorities arrested Brian Church, Jared Chase and Brent Vincent Betterly days before the summit in Chicago under Illinois' never-before-used anti-terrorism statutes, accusing them of planning to attack President Obama's campaign headquarters with Molotov cocktails. Defense attorneys asked at a hearing last week if prosecutors would show them the indictment. State's attorneys said they would only disclose it at an upcoming July 2 arraignment. But defense attorneys obtained the indictment this week from Cook County Circuit Court clerk's office, said Sarah Gelsomino, one of Church's attorneys and a member of the National Lawyers Guild. "This is highly unusual behavior that, at every stage, prosecutors have refused to talk to us," she said Wednesday. "It is symbolic that we couldn't even get the indictment directly from prosecutors themselves." Several messages left for the Cook County State's Attorney's office seeking comment were not immediately returned. A copy of the 12-page indictment provided by Gelsomino to the AP is dated June 13, and signed by Court Clerk Dorothy Brown, State's Attorney Anita Alvarez, and the grand jury foreman. It provides no details about the evidence. The indictment against Church, 20; Chase, 24; and Betterly, 24; includes conspiracy to commit terrorism and material support for terrorism  two charges under which they were arrested. They each could spend decades in prison if convicted. Defense attorneys have said all three men intend to enter not guilty pleas at the arraignment next month. The defense has criticized Illinois' anti-terrorism statute under which their clients are charged, saying it is too all-encompassing and ill-defined. Federal prosecutors handle the vast majority of terrorism cases in the U.S., distinguishing the case of the three activists. They also are the first people to be charged under the Illinois law adopted after the Sept. 11, 2001, terrorist attacks.